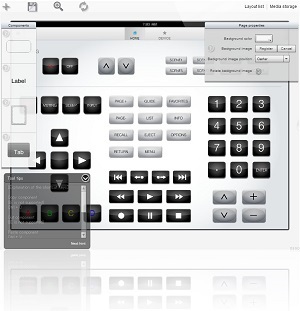 You can design the interface of your remote control displayed on the iRemocon app with the UI designer on the website. Not only create standard buttons or labels, but change an image to a button, set your wallpaper, and set a sound when you press the button (set a sound effect on the app). You can totally create your original remote control. Without purchasing iRemocon, you can try the UI designer and iRemocon app by subscribing for membership. Let’s make your personalized remote control! Set your favorite image as the wallpaper. Arrange strings and labels on your favorite position. Set an image as a button. Choose vertical or horizontal page scroll. Choose whether to lock a page while paging or not. Add tabs and set pages in the tabs. Set your favorite images over a tab. Set multiple buttons and transmission intervals over a macro button, and send infrared LEDs as programmed orders and intervals. Select sound when you press a button from about 100 sound effects. Please set sound effect from “Settings” > “Other settings” after the app runs. We introduce a basic use of the UI designer in about 6 minutes. The video moves very quickly through the explanation, so you may need to pause to examine details closely. The basic ways of using the “iRemocon” UI designer.